The Dodge Journey made its debut in 2008, at a time when the midsize crossover SUV segment was already crowded and highly competitive. That hasn’t deterred its manufacturer, Fiat Chrysler, as evidenced by the 2016 edition—the nameplate’s eighth model year. With its newest iteration, the Dodge Journey continues to masterfully blend comfort, utility, and value to make it an attractive choice for budget-minded customers. Besides a major refresh with the 2011 model year, the Dodge Journey hasn’t been a regular recipient of significant revisions to its mechanical or exterior components. However, the 2016 model year marks the first one for the Crossroad Plus, which is a slightly spruced-up version of the original Crossroad trim. Also, the AVP and Limited trims have been discontinued from previous iterations, and the base price points have been lowered for the SE, SXT, and Crossroad variants. The 2016 Dodge Journey is split into five trims: the SE, the SXT, the Crossroad, the Crossroad Plus, and the R/T. Each trim is available in front-wheel drive (FWD) and all-wheel drive (AWD). Depending on the drivetrain, the MSRP ranges from $20,995 to $33,695. The ability to add a one-year SiriusXM satellite radio subscription is available for the SE, and you can add Uconnect® voice command with Bluetooth connectivity on both the SE and SXT. However, if you go with the upper-level Crossroad Plus, there’s so much more you can add. Heating capability on the front seats, leather seating surfaces, a second-row overhead 9-inch video screen, a five-year SiriusXM Traffic and Travel Link subscription for location-based services, Garmin navigation system with an 8.4-inch touchscreen, remote start, and camera-based back-up and rear park systems are just a few of the many possible additions. Powertrain-wise, you have the option of going with the bigger and more powerful of the two available engine choices if you choose the FWD version of the SXT and the two Crossroad variants. Although normally a second-row vehicle, there’s the availability of a third row to expand seating capability to seven people. As a mid-size crossover vehicle, the 2016 Dodge Journey seats up to five people, and there’s plenty of cargo space, especially when you fold down the rear seats. An upgrade to the Crossroad Plus or R/T adds 6-way power adjustability and 4-way power lumbar support on the driver’s seat. 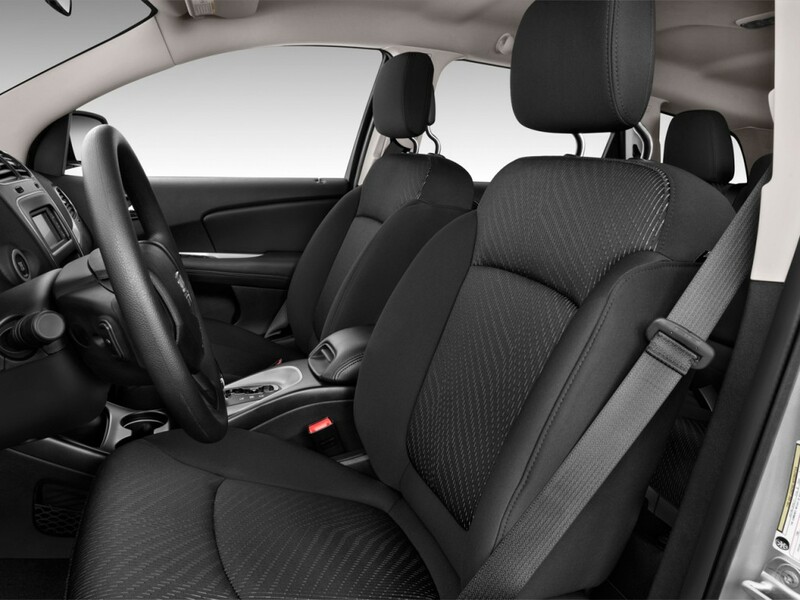 The R/T in particular is the only Journey trim with has a dimpled leather-wrapped steering wheel and leather-trimmed seats with perforated panels as standard interior features. Entertainment on the 2016 Dodge Journey is provided by the UConnect® multimedia system, which at the base level, comes with six speakers and includes a USB and audio jack interface for mobile devices, steering wheel-mounted controls, and a 4.3-inch touchscreen display. The Crossroad Plus and R/T get an 8.4-inch touchscreen display that replaces the standard 4.3-inch one, with the latter getting the addition of a subwoofer. 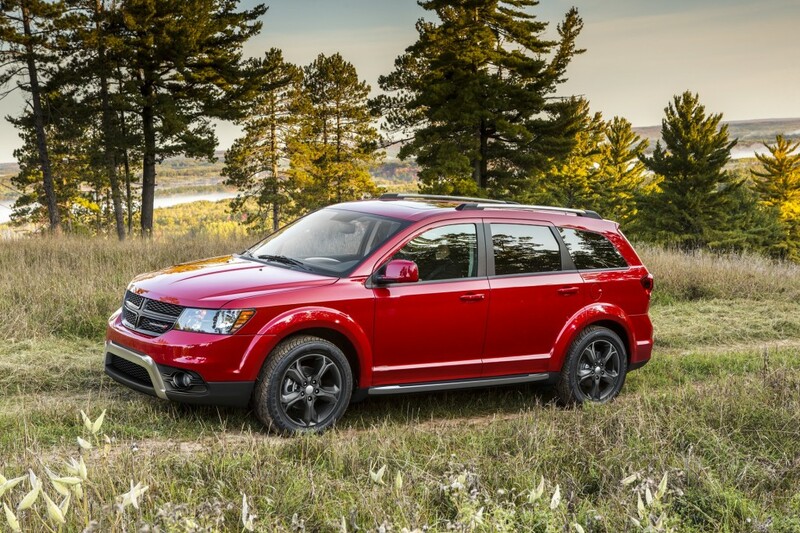 The engine on the 2016 Dodge Journey depends on what drivetrain or trim you choose. There’s a 2.4-liter 16-valve inline four-cylinder engine (I4) with 173 horsepower and 166 lb-ft of torque; and there’s a 3.6-liter V6 with 283 horsepower and 260 lb-ft of torque. The I4 is standard on the FWD version of the SE, SXT, and Crossroad variants, while the V6 is standard on the FWD version of the R/T and the AWD version of the Dodge Journey (regardless of trim). The I4 is paired with the 4-speed AutoStick® automatic transmission, while the V6 is hitched to a 6-speed automatic transmission named the 62TE. Regardless of trim, each transmission features a driver-interactive transaxle shifter for permitting greater driver control over gear shifting. Although fuel economy slightly varies based on the powertrain configuration, you will get the best out of the Dodge Journey if you go with a trim with the I4 and a FWD layout; it provides 19/26 mpg. For more power and acceleration ability, the V6 is the obvious choice, with a reduced fuel efficiency of 16/24 mpg. For protection in the event of an auto collision, the 2016 Dodge Journey comes with front impact airbags facing the driver and front passenger, a knee airbag for the driver, side impact airbags mounted on the front seats, and side curtain airbags mounted on the roof. Electronic vehicle stability keeps you in control of the vehicle in less-than-favorable driving conditions, with electronic roll mitigation using the system’s control sensors for reducing the potential for wheel lift when performing a sudden or evasive maneuver. Four-wheel disc brakes are on the Journey to shorten stopping distances and enhancing braking prowess. And an anti-lock braking system works with the disc brakes to keep the wheels from locking up when coming to a stop. Other safety features include traction control for maintaining control on slippery surfaces, speed control for setting your desired speed, and a theft-deterrent security system with engine immobilizer. The 2016 Dodge Journey has a four-wheel independent suspension, which includes a multi-link design in the rear. The touring-oriented Crossroad variants have a suspension that is tweaked to better absorb any turbulence that the vehicle encounters in rough terrain. Combined with firm-feel power steering, the 2016 Journey handles winding roads quite well, with a ride that is graceful regardless of weather or road conditions. Go with the R/T in particular if you want a truly high-performance suspension, which is optimally tuned to handle anything thrown its way. Thinking of buying a Dodge Journey? Already own one? Leave a comment and let us know what you think!